Ordinarily, this would mark the end of a great IFBB spectacular. 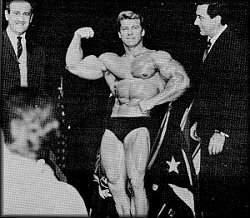 Certainly, the fans had already seen plenty – the best physiques the world had to offer (MR. AMERICA winner Dave Draper and MR. UNIVERSE winner Earl Maynard). 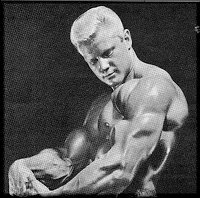 But tonight they would see something new – the introduction of what will soon become the world’s greatest physique contest … the 1965 MR. OLYMPIA. The contest, open only to top title winners, will draw the greatest each year. And winners may return to try again – to re-establish greatness each succeeding year. And year by year, this contest will grow … and it will quickly become the one great incentive to keep the stars training. As soon as he stepped out of the wings, the auditorium exploded with thunderous applause. It was deafening … a roar … and flashbulbs flooded the stage with so much light that it seemed as if the sun had rose. The roar became a deafening hum and the floor actually trembled from the pounding of feet. 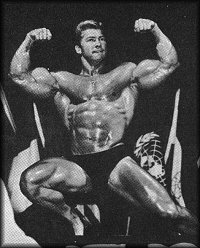 The crowd went wild – mad with excitement and enthusiasm … and it was clear that Scott was the winner – that he had been unanimously declared the world’s greatest bodybuilder … the first of the great bodybuilders – the first MR. OLYMPIA. When the beautiful jeweled crown was awarded to Scott, the fans were numb – but they still cheered. 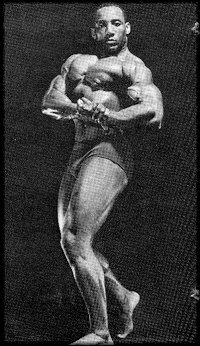 And after several hundred more photographs were taken, the curtain slowly closed – only to end another annual IFBB spectacular. Snapped into reality again by the houselights, the fans rushed into the streets and surrounded the Academy. It was a sea of people – and as each contestant left the theatre that night, each was greeted with a round of applause and cheers. Several contestants were tossed onto the shoulders of enthusiastic well-wishers – as they triumphantly marched them through the streets. And until 2 AM and later, hundreds were still outside – waiting for the great Scott. Think this report is exaggerated? Believe us … we couldn’t begin to express on paper the excitement you missed if you were not there. To you we say – join us next year for the greatest of the great bodybuilding shows.